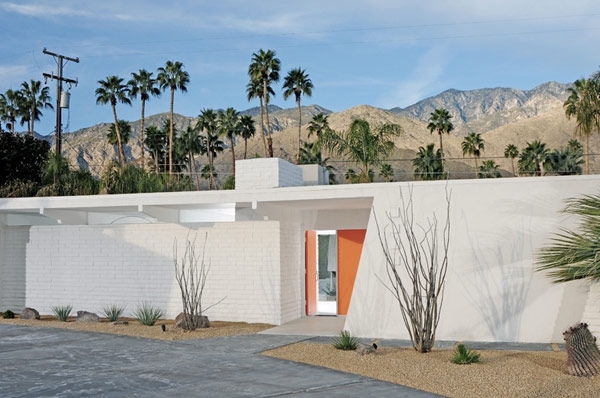 Located in Palm Springs, California, this stunning mid-century home has a gorgeous white design. The exterior of this single level house is completely white. Tall trees surround the home, and there’s a little bit of greenery incorporated into the fabulous outdoor area. An inviting pool provides a magnificent entertaining and relaxing space, and loungers and a love seat create an outdoor seating area. We love the painted brick on the outside of the home, it adds a significant amount of interest to the exterior. 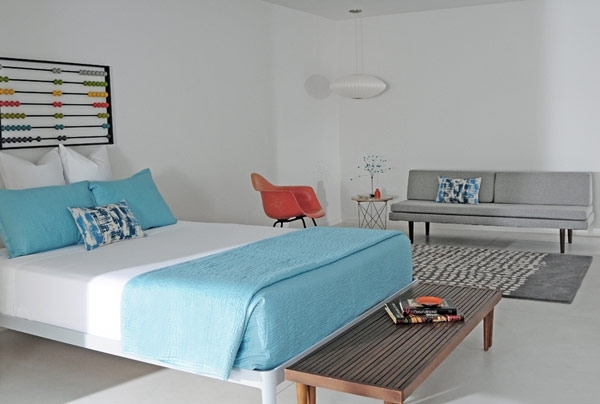 Pops of color are added through the potted plants, the turquoise cushions, and the orange entryway: absolutely gorgeous. 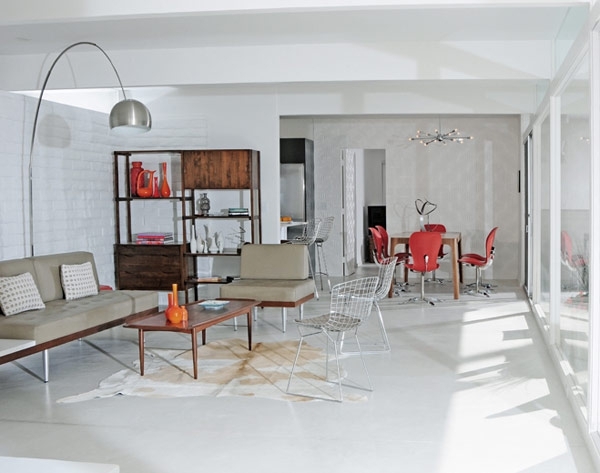 Inside this mid-century home, the white design and pops of color continue. In the living room, large windows provide a lot of natural light and marvelous views of the outstanding outdoor space. The furniture in this home is out of this world. A neutrally colored sofa, a neutrally colored chair, a wooden coffee table, and modern white chairs create an amazing seating area. A light animal skin rug adorns the white floors and a tall silver lamp adds a touch of laid-back glamour. The white brick seen on the exterior of the home continues on the inside, adding even more interest to this stunning design. We love the wooden bench sitting next to the window, and the pops of orange in the décor. This seating area is amazing. The lounge chair is phenomenal with its beautiful wood and subtle pattern. 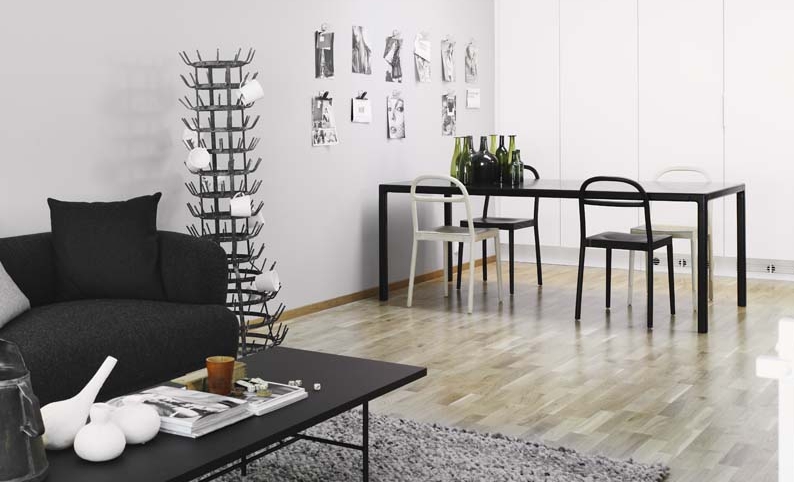 The curves in the side table are delightful, and the lamp is unique and exciting, adding a lot of energy to the space. 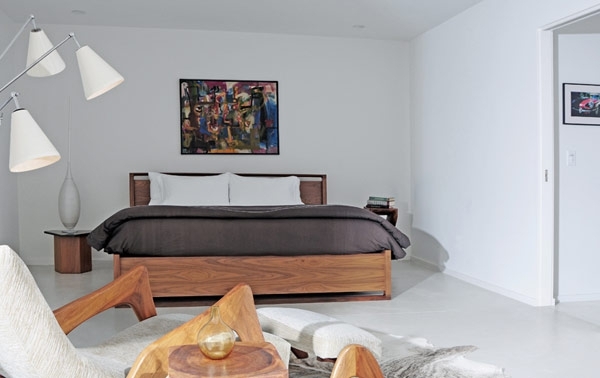 This bedroom is magnificent, and we love the way the wooden bench warms the design. The abacus on the wall is a unique touch and the seating area is sublime. What do you think? Do you love this white design as much as we do?